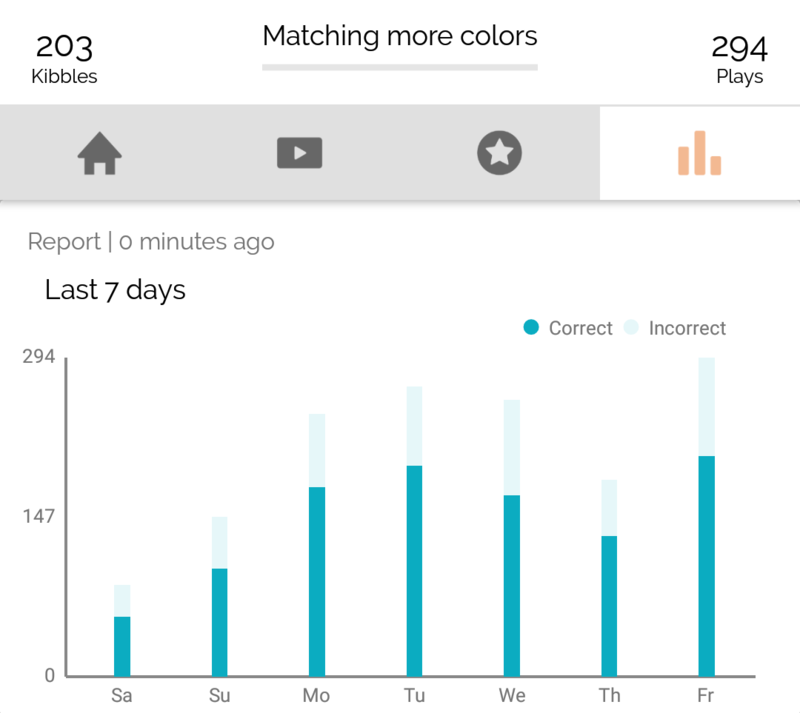 We're excited to announce that you'll now be able to see charts of your pup's activity updated live in your app. Earlier this year we began providing summaries of your dog's activity on a weekly basis, every Saturday. Now, the last 7 days will always be available, and updated in real time. Want to check in on your dog, midday on a Thursday? No problem! The top chart in the "Reports" tab will show you all the activity that happened today, so far, as well as the previous six days. 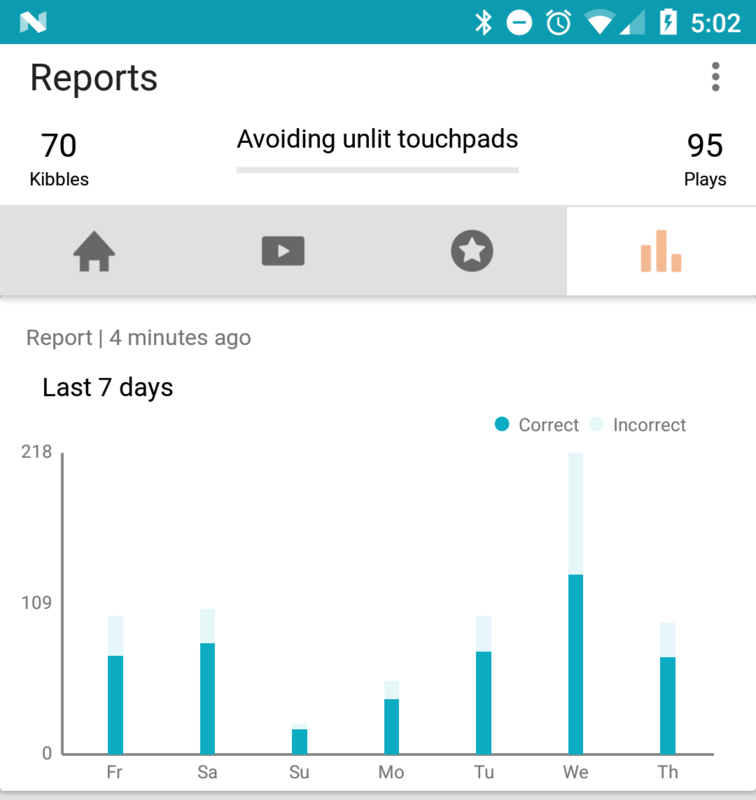 We'll still keep the counter of today's kibbles and plays on your app's main screen, but now timely information will also be visible in chart form. You might see a chart like this on a Thursday. As you check in throughout the day, activity would keep being reflected in the bar on the right. It would keep advancing for each play, until midnight on Thursday. This is a chart showing Einstein Bebop's activity from his first week on the Hub. He took to the Hub pretty quickly — on Wednesday, he played 218 times, on got to "Avoiding unlit touchpads" by Thursday. Every dog is different. Some dogs play 10 times a day, and others play 500 times a day. Some take a while to get comfortable with the Hub, but others race through the first challenges. Charts help show just how amazingly different each dog takes to playing on the Hub, and how even your own dog's behavior can vary week-to-week, or even day-to-day. Who is Einstein Bebop, and is that his real name? Yes, that's his name. 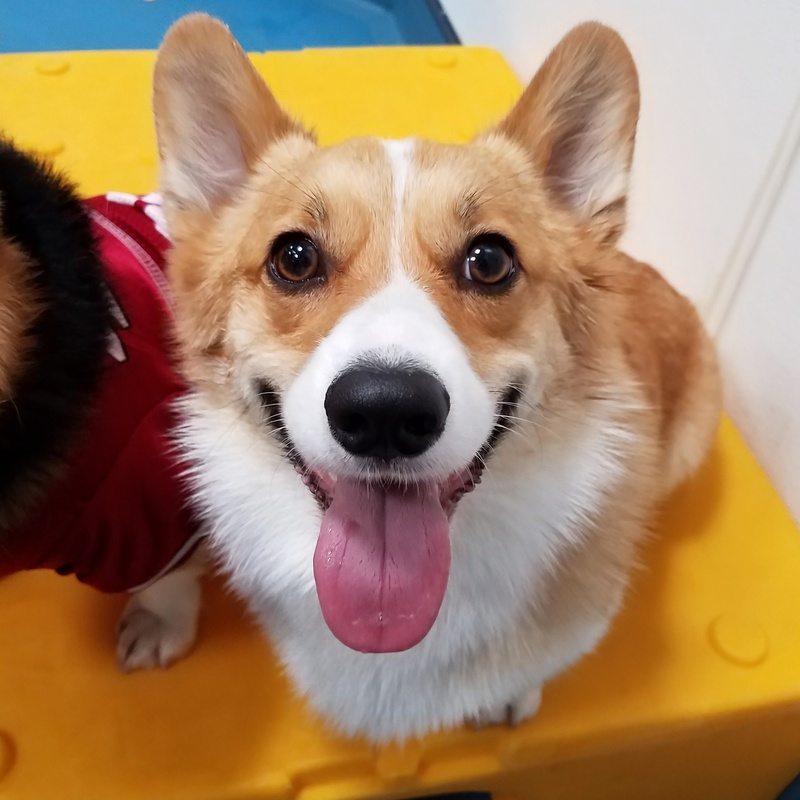 Einstein is a 1 year old Corgi who has been playing on his Hub for about four months. The data in the chart above is real data from his first week of playing! What's Einstein up to now? Here's Einstein's most recent week of data. He's now on "Matching more colors" and even more active than he was when he first got started on the Hub. How long does it take for the chart to update? About 10 seconds. While you're looking at the "Reports" tab, your chart will update automatically, without requiring you to refresh anything. After your dog solves a puzzle, the tray comes out so they can eat their food reward, and then the tray goes back in. Then, your Hub reports what happened and your app updates the chart. Under the hood, we use Google's realtime database to update your app with your dog's activity. They have a good track-record of keeping things running. From our records, we see that updates happen very quickly 99.7% of the time. If your app happens to miss a play, we can correct for it when the next one arrives. Will I still be able to see weekly reports of my dog's data? For now, we plan to keep the weekly summaries from previous weeks. The live chart will always live at the top of your "Reports" tab, and by scrolling down you can find charts from previous weeks. You'll notice that the weekly charts include a bit more information about your dog's performance and activity, such as the percentage correct each day. Eventually, we may remove charts older than 3 months. Find more information about weekly charts here. Weekly charts are available on iOS app versions 1.0.3 and up, and Android app versions 1.0.80 and up. Live charts are available on iOS app versions 1.1.0 and up, and Android app versions 1.0.93 and up.